2010 Calera Central Coast Pinot Noir: QPR Alert? It was just about a year ago when I tasted the wines of Sojourn Cellars for the first time. Since then I've enjoyed their wines so much I feel almost remiss about not having written about their wines here previously. 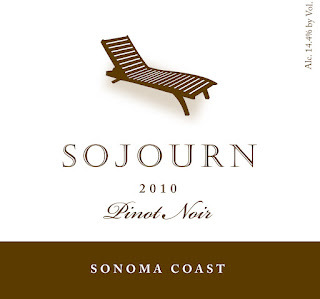 Sojourn is a Sonoma-based producer of mostly Pinot Noir (~$39-$59) and also Cabernet Sauvignon (~$39-$95). The first time I tasted their wines was at an event in Cambridge a friend on their mailing list invited me to. Founder Craig Haserot was on hand pouring the wines as a chance for their fans in Massachusetts to try before they buy. Definitely a cool gesture. He's got a swagger about him for sure. Deep knowledge about Burgundy and a passion for Pinot - especially Sojourn Pinot! I thought their wines -- 2009s at the time -- showed great potential. They were powerful and delicious but with some rough edges I hoped would soften with time. As I've gone back and tasted some of those wines 6 to 12 months later they have indeed softened nicely and are showing fabulously. The style here, speaking about their Pinot Noirs, is more of a Cab-drinker's Pinot Noir. I find they hit the spot when I'm in the mood for a Pinot Noir with a little extra substance. But that's not entirely the case as you can see in their bottlings from the Alder Springs and Rodgers Creek vineyards for example. These wines show restreaint and reveal earthy characteristics like mushrooms and wet red clay. It's a testament to winemaker Erich Bradley's ability to deliver flavorful, delicious wines regardless of the origin. Their wines may be considered by some to be ripe but I've not yet tasted one that crossed the line into the over-ripe territory marked by raisiny/pruney flavors. They've got a tasting salon in Sonoma if you happen to be planning a visit. And it's hard to think of a more consumer-friendly high quality producer. Free shipping on 6 or more bottles and 10% off 12 bottles or more. Question of the Day: Have you tried Sojourn's wines? If so, what do you think?